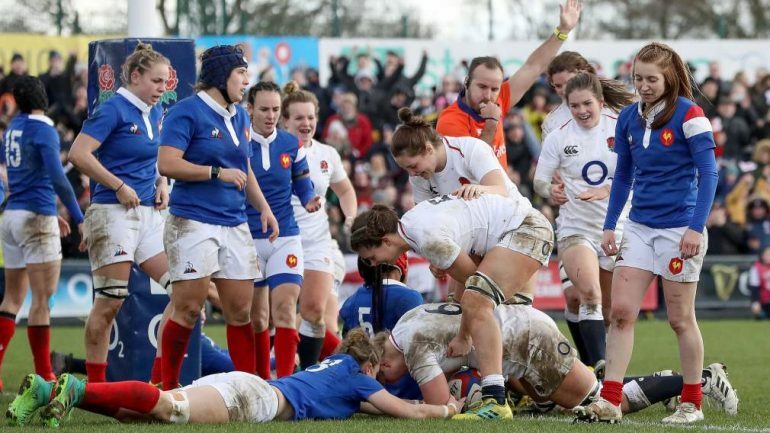 England Women made it two bonus-point wins from two in the 2019 Women’s Six Nations as they beat France 41-26 at Castle Park in Doncaster. Despite prop Vickii Cornborough being shown a yellow card, England scored again with a player less when Emily Scarratt’s clever grubber bounced up perfectly for the onrushing Smith to gather and sprint clear. England were not done before half-time, when McKenna’s superb line break set up Breach for her second as she dived over in the corner as the bonus-point was secured before the break. France responded in the opening stages of the second half when Safi N’Diaye got their first points, but some strong forward work close to the line saw England respond and Cleall crossed for her second. An excellent break from France scrum half Pauline Bourdon gave the visitors hope, before Red Rose replacement Hannah Botterman finished a series of pick and drives and then Catherine O’Donnell went over in the corner for England’s seventh. But Romane Menager crossed in the final play of the game to secure a losing bonus-point. The Red Roses all-time top points scorer Katy Daley-Mclean passed 500 international point in Doncaster when she converted Breach’s early score, from which she provided the assist with the kick.